Standing 30 feet below the cold, snow-covered Montana earth, looking at a live, 60-foot-tall Minuteman III missile that he could reach out and touch (if that were allowed), Alan Armentrout found himself speechless. Armentrout and five other Y-12 Production employees — Dwayne Beaty, Aaron Burlingame, Marty Fritts, Jim Hackworth and Carl Hill — spent a week last month at Malmstrom Air Force Base near Great Falls, Montana, witnessing firsthand the active missiles whose nuclear payloads begin as materials and shapes in Y-12’s production facilities. The group climbed down into a Minuteman III missile silo; toured the associated launch capsule where, behind 10-ton blast doors, Air Force operators sit strapped into chairs at their workstations; and witnessed a warhead changeout from both the silo and the payload transporter situated above the silo’s opening. Throughout their time in — and under — Montana, the men couldn’t help but think of Y-12, nearly 2,000 miles away, and its role in the massive display of force in front of them. UPF employees collected donations to determine who would take the Polar Plunge, a leap into the University of Tennessee’s outdoor swimming pool. Managers from the Uranium Processing Facility raised nearly $9,000 for Special Olympics Tennessee by leaping into ice cold water on Feb. 27 as part of the Polar Plunge, an annual fundraising effort. UPF was the top fundraising team in Knoxville, contributing 45 percent of the total amount raised in the city, and four UPF managers — Aaron Love, Tony Giordano, Matt Nuckols and Jim Sowers — were the top individual fundraisers. Other UPF participants were Bob Bentley, Mark Braccia, Joe Brown, Jesse Jones, Mike Pratt and Bryan Roberts. Nominees collect donations to determine who will take the Polar Plunge, a leap into the University of Tennessee’s outdoor swimming pool. At UPF, it was a hotly contested race until the polls closed on Feb. 25. Ultimately, Deputy Engineering Manager Aaron Love edged out Deputy Project Manager Tony Giordano for the top spot by a mere two votes, raising $1,857. “Thanks to good-natured competition and the generosity of UPF personnel, we led the city in fundraising for this great cause,” said NextGen president Amit Patel. NextGen is an employee resource group focused on supporting the orientation, development, retention and empowerment of employees as they begin and build their careers. Students from Farragut High School work on their entry for the FIRST (For Inspiration & Recognition of Science & Technology) robotics competition. Consolidated Nuclear Security, LLC plays an active role in strengthening the quality of FIRST (For Inspiration & Recognition of Science & Technology) robotics competitions for individual high school–aged teams in Tennessee and Texas that compete head to head on a special playing field with robots they have designed, built and programmed. FIRST was founded in 1989 to inspire students’ interest and participation in science and technology. CNS sponsors the Smoky Mountain Regional competition as well as individual teams at: Robertsville Middle; L & N STEM; and Austin East, Bearden, Bushland, Caprock, Farragut, Hardin Valley, Oak Ridge, Roane and Webb high schools. Marvin J., a student on the team, validated Skinner’s statement. He said, “For me, FIRST has helped improve my knowledge all around. It has helped me better understand the influence of technology and engineering in everyday life.” He also noted that participating in the competition expanded his knowledge regarding everyday tools and the importance of teamwork, which enhanced his collaborative skills. FIRST robotics teams are in phase one, which is the six-week design and build phase of their team robot. Phase two of the robotics season involves seven weeks of competition in districts or regions. The Smoky Mountain Regional competition will take place at Knoxville’s Thompson-Boling Arena March 30–April 2, 2016. The championships will take place in April. For more information about the competition visit TNFIRST or firstinspires.org. CNS offers groups to help early career professionals. Whether you’re starting your first career or establishing a new one, transitioning into the nuclear industry from college, the military or another profession or organization can be an exciting and challenging experience. Consolidated Nuclear Security, LLC has three programs that offer professional development and networking opportunities to help those entering this unique field to adapt and grow successfully. The Early Career Group at Y-12, NextGen at the Uranium Processing Facility project, and Pantex Outreach and Leadership Organization, called POLO, all focus on career development, networking, retention, community service, team building and empowerment. The groups target employees beginning and building their careers and rely on experienced employees to fill leadership and mentoring roles. Formed in 2010 as Connect Y-12, the Early Career Group launched a revamped program this year based on the success of Connect Y-12. About 50 people attended the brown bag information session in the spring, and interest in the program remains high. Guest speaker events with CNS senior leaders and after-hours networking events with business leaders and peers from UPF, Oak Ridge National Laboratory and Young Professionals of Oak Ridge are among the most attended. The events are planned and managed by a six-member leadership team. The UPF project launched NextGen in April and currently has 118 members from a variety of disciplines. The chapter is managed by a 13-member board with Amit Patel serving as president. The group hosts networking events with personnel from all levels of the UPF project. At one event, UPF project director Brian Reilly shared insights from his career. Another event organized by the NextGen board is the quarterly tour of the UPF construction site. Ten members visit various locations to see first-hand progress on the project. Like the Early Career Group, NextGen members regularly participate in after-hours networking events. “These events are geared to get people out of the office and into a neutral, friendly environment where they can talk off-line,” said Tim Barkley, NextGen execution co-chair. “People who don’t typically interact on a daily basis get to meet each other.” In May, members also participated in the Oak Ridge Dragon Boat Festival, a fundraiser for a local nonprofit. In September, they hosted a picnic for all UPF employees, and in December, they’re wrapped up the year with a Toys for Tots event. The Pantex Outreach and Leadership Organization was created in August 2014 specifically for science, technology, engineering and math employees. Managed by a 14-member committee, POLO is based on the College Pre-Hire Program and has about 60 members. Monthly meetings include a segment called “My piece of the mission” in which guest speakers tell about their work at the plant. Mission Engineering managers Joe Papp and Dennis Viera have presented at the meetings, as have POLO committee members. Y-12’s Tucker Fritz recently spoke about Y-12. NextGen members participate in the Oak Ridge Dragon Boat Festival. Members of the Pantex Outreach and Leadership Organization build a handicap accessible ramp for a homeowner as part of the Texas Ramp Project. POLO members volunteer at the Wildcat Bluff Nature Center. 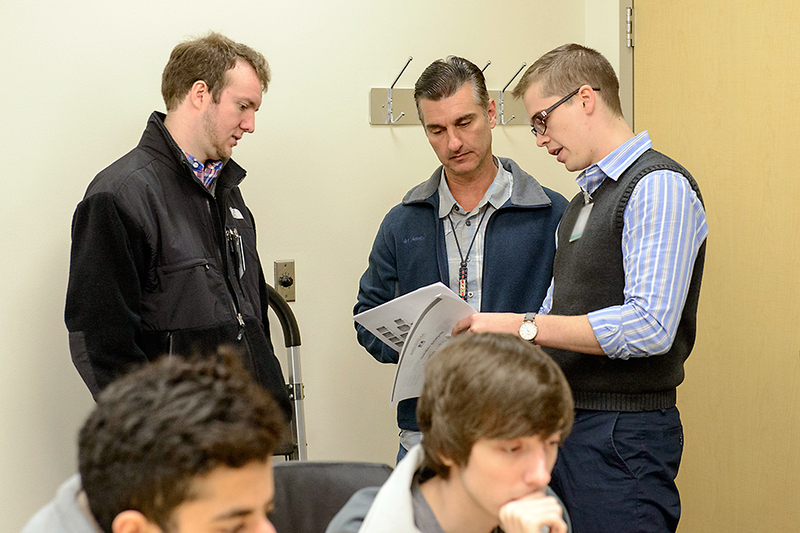 UT students and Y‑12 nuclear security subject matter experts conduct a battle board challenge in Oak Ridge. It’s like a semester‑long chess game with the final moves played live at Y-12 National Security Complex. 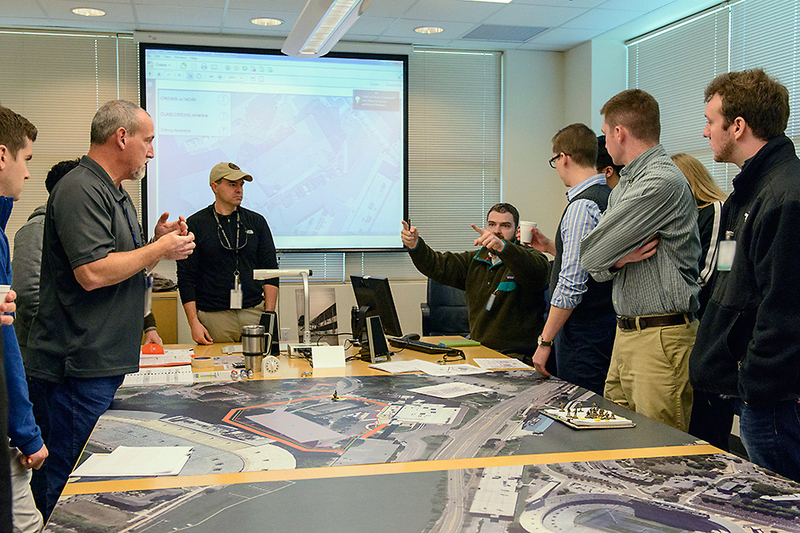 Consolidated Nuclear Security, LLC nuclear security training experts and University of Tennessee graduate students strategize over a 3‑dimensional battle board during the culmination of an intense college course — a simulated, practical, force‑on‑force, military‑type exercise in which the victors control the virtual cached enriched uranium. Y‑12 and UT have completed seven battle board exercises, each with its own flavor. 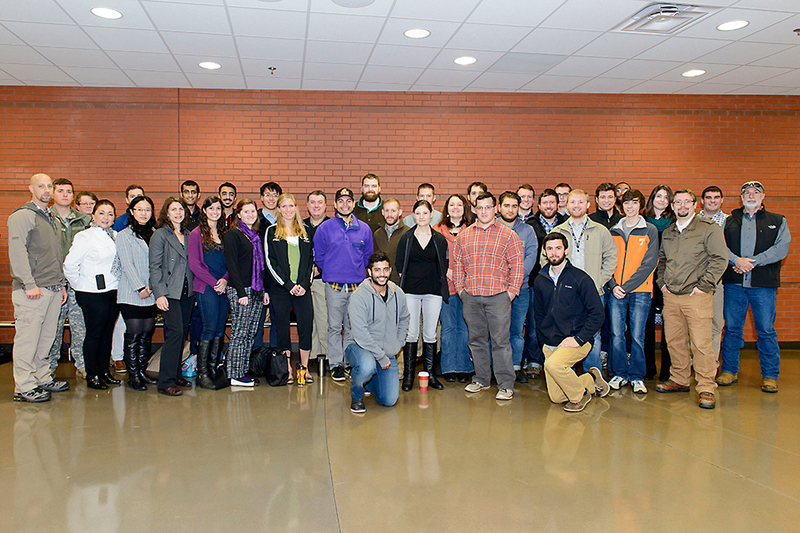 The fall 2015 class of 32 students, which included active‑duty military personnel pursuing advanced degrees, divided into teams early in the semester. The red team played the adversaries (bad guys) and the blue team acted as the protective force (good guys). They held frequent, separate strategy meetings to build their attack/defense of a mock nuclear facility. The red team’s goal was to infiltrate a mock facility; the blue team was well prepared and ready for an attack, with multi‑tiered tactics in place to defend the facility and the stored nuclear material. The teams moved back and forth, deliberating in separate rooms between turns, taking their best guess at the other team’s next play on the board. This year, the blue team reigned, protecting the nuclear material and leaving the red team with just one man standing. 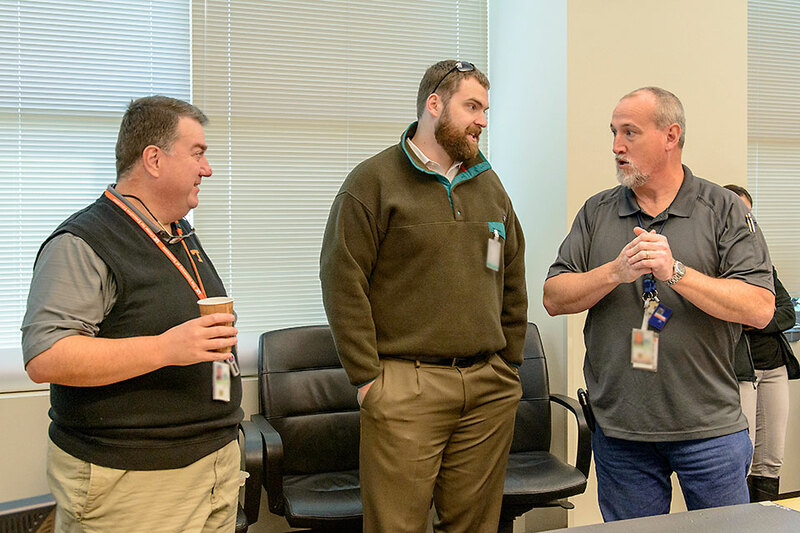 “Y‑12 is a gem with about 15 subject matter experts available to help the UT students understand and experience physical security, vulnerability analysis, performance testing, safeguards and security, and nuclear materials control and accountability,” said Maddux. He has 30 years of broad experience in the nuclear security field and works closely with Hall to ensure the students receive a healthy balance of classroom and hands‑on training. Hall, world renowned in the intervention of nuclear terrorism, brings a wealth of field experience to the classroom. Before joining the UT’s nuclear engineering staff in 2009, he worked at Lawrence Livermore National Laboratory and supported the Department of Homeland Security. “We’re educating grad students — from nuclear engineers to writers — about nuclear weapons, material security and crimes. We truly value our unique partnership with CNS,” he added. 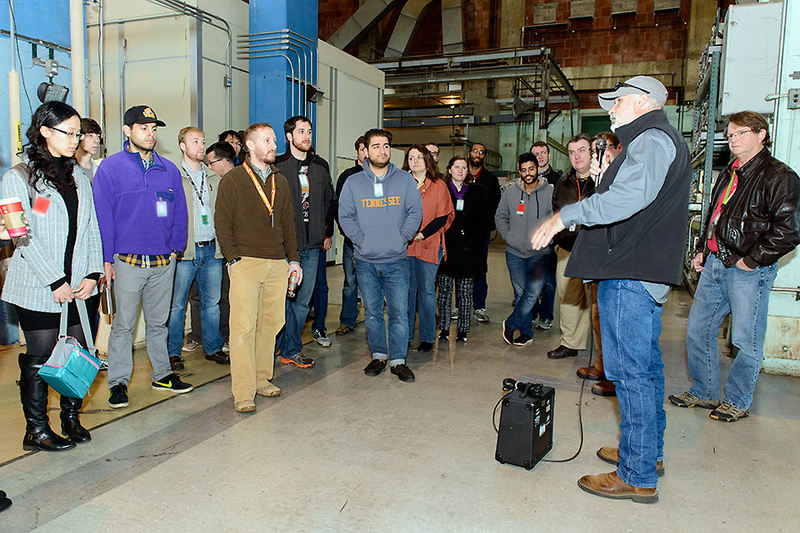 At the semester’s end, UT’s grad students took away their final grade and unmatched national security experience, leaving the virtual cached enriched uranium safe and secure. 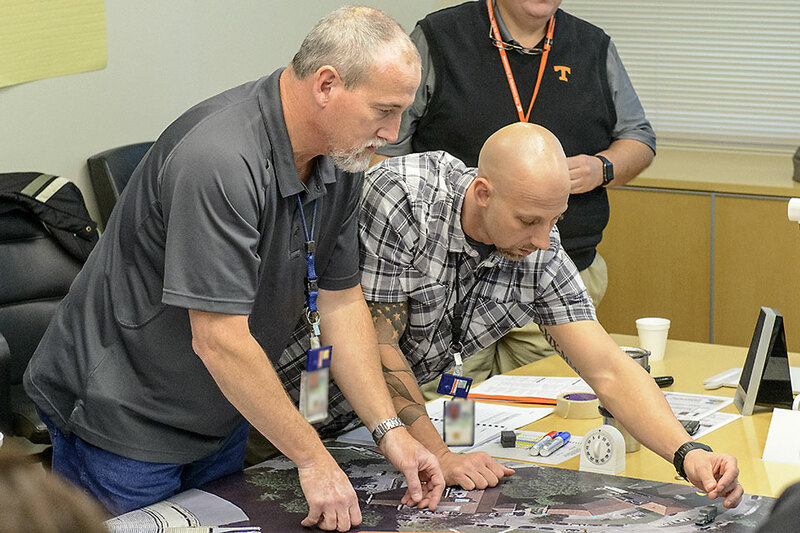 Joining forces, CNS and the University of Tennessee offer well rounded training — both on the Knoxville campus and at Y-12 — for our nation’s next generation of nuclear security decision makers. 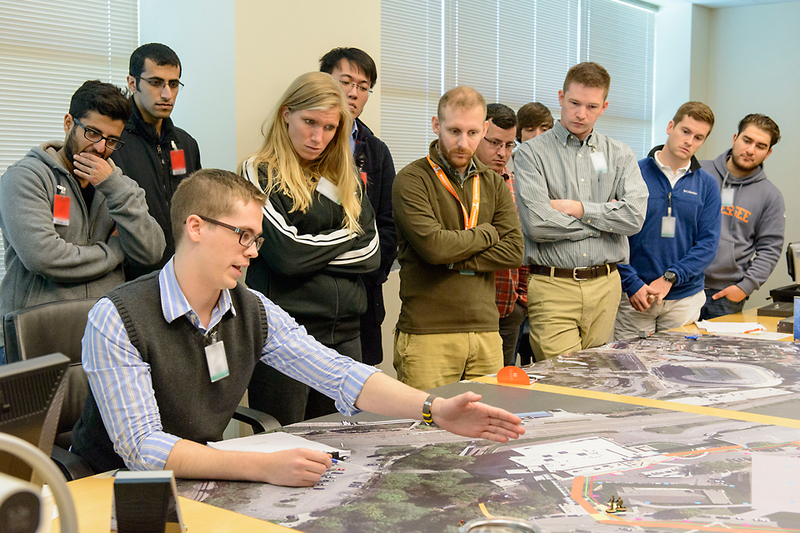 Y-12 recently hosted a tour and 3-D battle board challenge for graduate students. 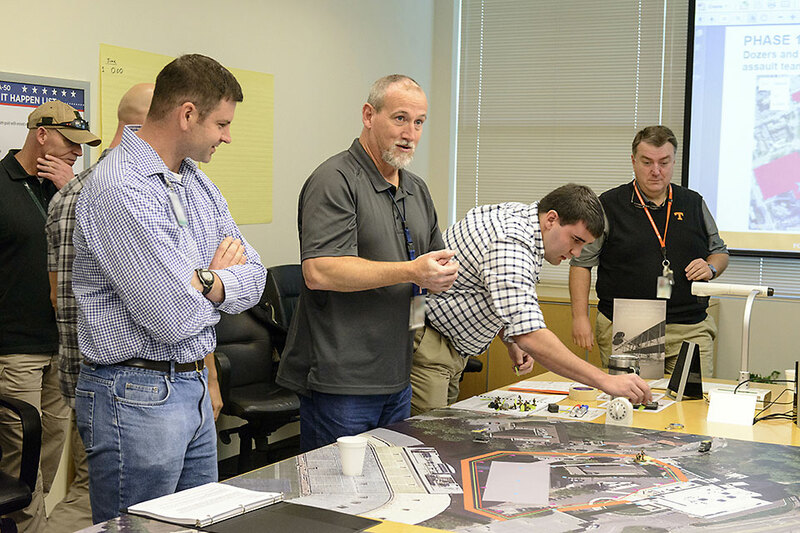 The exercise involved strategic moves by a team protecting a mock nuclear facility and a team attacking the facility to control the stored nuclear material. 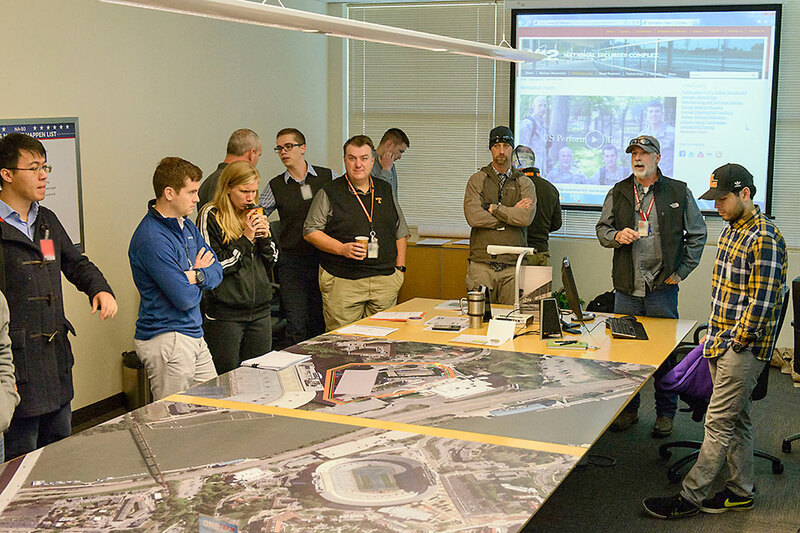 UT’s Nuclear Security Science and Analysis class and Y-12 nuclear security subject matter experts conduct a battle board challenge in Oak Ridge. KJ Maddux and Bill Wilburn kick off the day with a tour of Y-12, offering the students an inside-the-fence glimpse of the kinds of nuclear security they’ve been studying. The ground rules are set before the battle board engagement begins. The exercise is a simulated attack on a facility storing enriched uranium. UT’s Howard Hall and John Gill and Jeff Knott (Y-12) discuss battle board strategies. The blue team’s leader (Michael Moore, nuclear engineering student) describes his team’s next move to protect the virtual cache of enriched uranium. Y-12’s Dan Romano (center) serves as the controller for the blue team. Jeff Knott and Casey Cole (both of Y-12) make crucial moves on the battle board for the protective (blue) team. Mike Shattan (left), captain of the adversary team (or red team) and Army major, reviews his team’s next move on the battle board. The blue team discusses strategy. 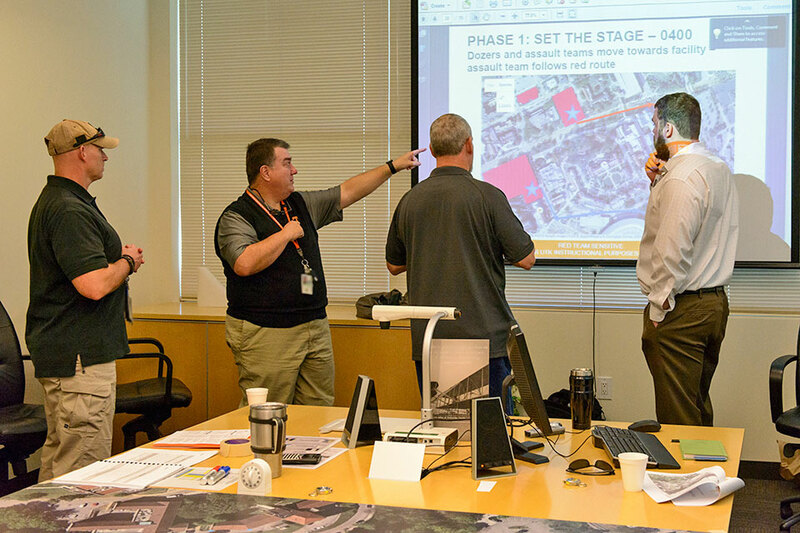 At the end of the day, Y-12’s Greg Verner, Howard Hall, Jeff Knott, and John Gill (UT) summarize the battle board event and the lessons learned.